Good times up north! This will be a solid ride through some beautiful country. Straight north from Hurstbridge we'll visit Mt Sugarloaf (because I've never actually been up there before) then down the other side towards Hazeldene before ducking into the Disappointment State Forest. We'll keep heading north and pop out at Murchison Gap before flying down to Strath Creek Hotel for a beer. 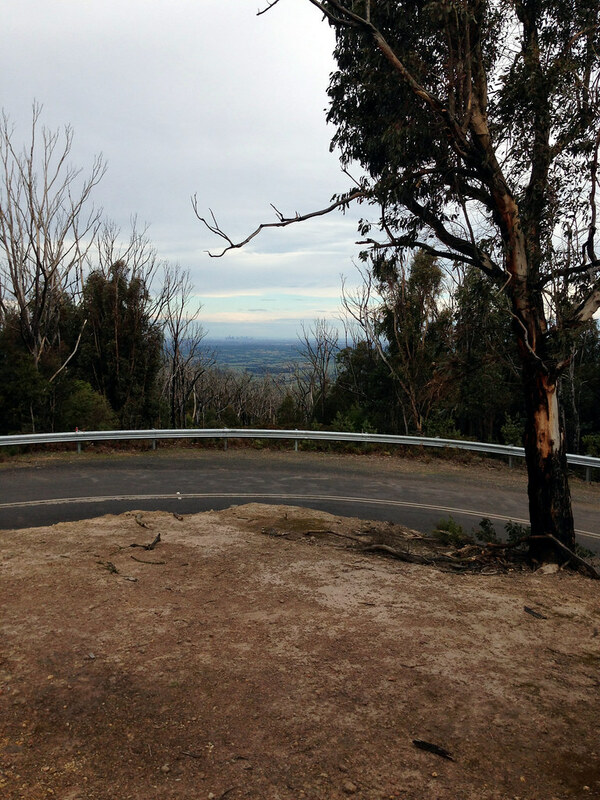 From there we'll take an old fave, Upper King Parrot Creek Road, before climbing back up to Kinglake Central and then bombing down Bowden Spur Road and back to Hurstbridge. Beautiful country, some paved roads, some dirt roads, some solid climbs and some screaming descents. And beer. What's not to like? 9:30am start to cater for train commuters, I'll be on a singlespeed with CX knobbies, bring 2 bidons or a bladder. Unfortunately, the three tourers lost a man early on - Toby and Al were keen as mustard as we hit the first dirt of the day on Eagle's Nest Road but Neil found he was settling into a slower pace than the rest of the group and told us to ride on so he could take his time and enjoy the day at his own speed. Apparently he was familiar with the roads as he'd ridden a similar route about 30 years ago. On the same frame, no less. Chapeau Neil! I like your style. We reached Pine Ridge Road in good time and found that it was unridably steep and rutted. Even the MTBers hiked large chunks of this one. What a grind. 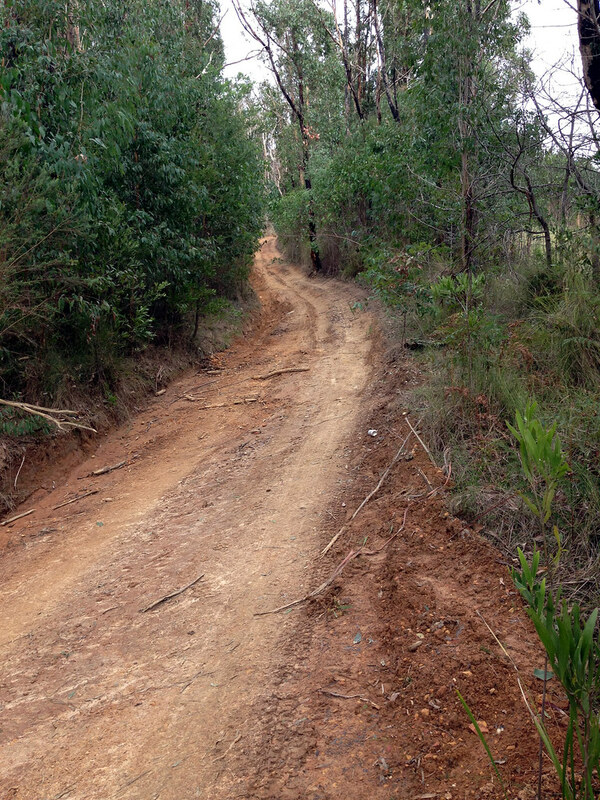 Calling it a "road" is being very optimistic - it's a fire trail at best. Actually no, not even that - there's too much deadfall and a huge erosion channel down a lot of it that would see even a 4wd high and dry with nowhere to go. We strung out along the length of the road - some resolved to pushing the whole way, some trying to get back on and ride, with varying levels of success. At the top of we found a bunch of brand new houses - the area was one of the worst hit in the 2009 fires - and turned left to go check out the lookout at Mt Sugarloaf. Nice and clear. Could see the city and even the dark line of Mt Martha/Arthurs Seat way off on the horizon. 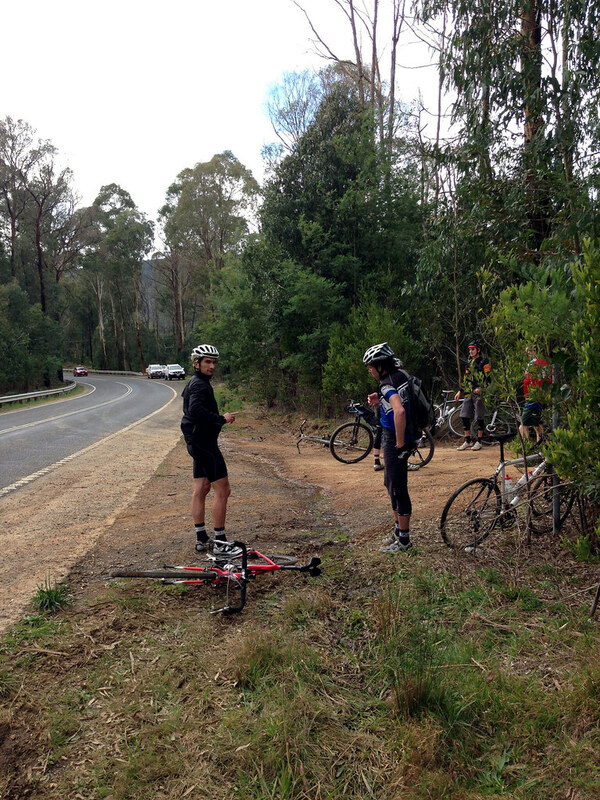 It was chilly in the wind so we rolled on back to the main Kinglake Road. 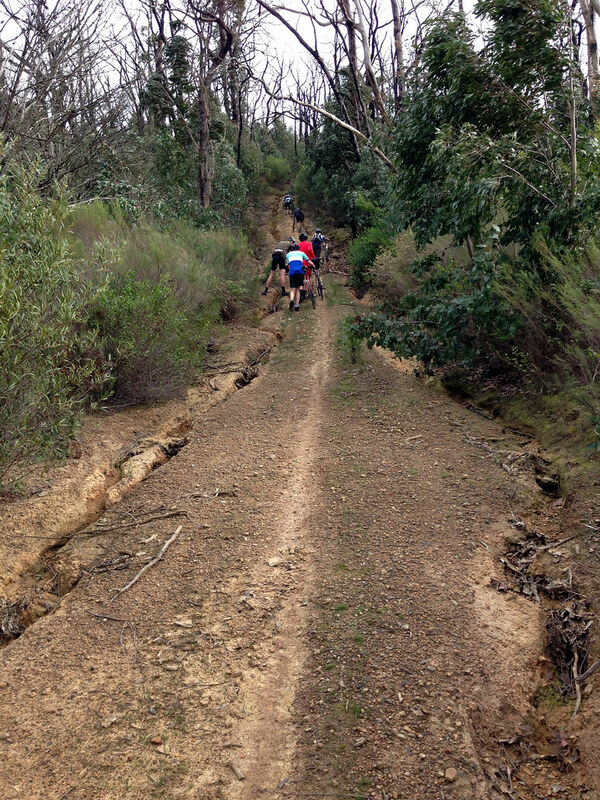 The rest of us took a shortcut down through some pine plantation to reach Whittlesea-Yea Road. Well made road, lots of trees and then lots of breaks in the trees so the view was always changing. I liked that section. 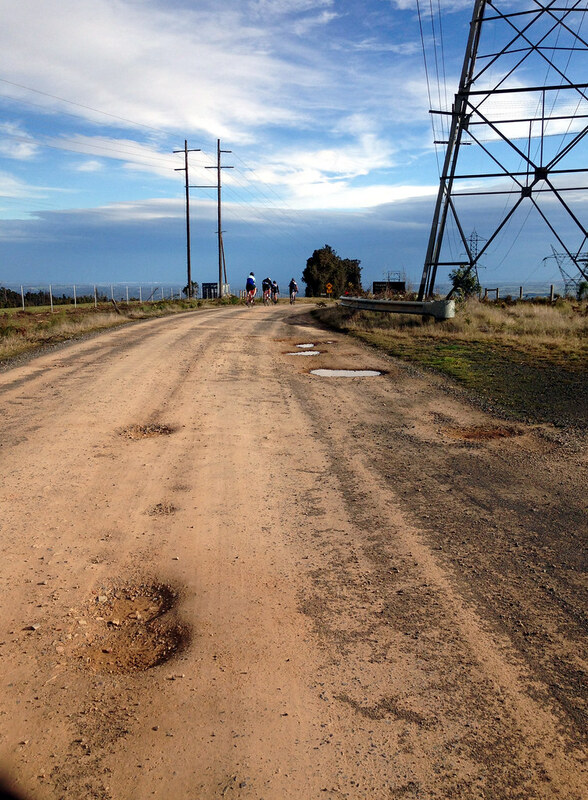 We regrouped at Whittlesea-Yea Road and waited for Che to roll in - he'd hit a rock and pinch-flatted apparently - very easy to do on a rocky descent with skinny tires. Paved road to Hazeldene was uninteresting - lots of traffic, me and Che spinning out our single 2:1 gears trying to stay on Mark's wheel then finally accepting our fate and letting everyone ride away. Mark said later "you could have asked me to slow down a bit." Which was very true. The shop at Hazeldene delivered the goods. Sausage rolls, pies, burgers, chocolate bars, chocolate milk. We sat around at the tables outside and chewed the fat. It became pretty apparent that, if we continued with the planned route, we wouldn't get back to Hurstbridge until after dark. Well, I knew _I_ wouldn't anyway - I was probably the weakest link on this ride, being on a singlespeed and feeling pretty unfit amongst a solid bunch of geezers. 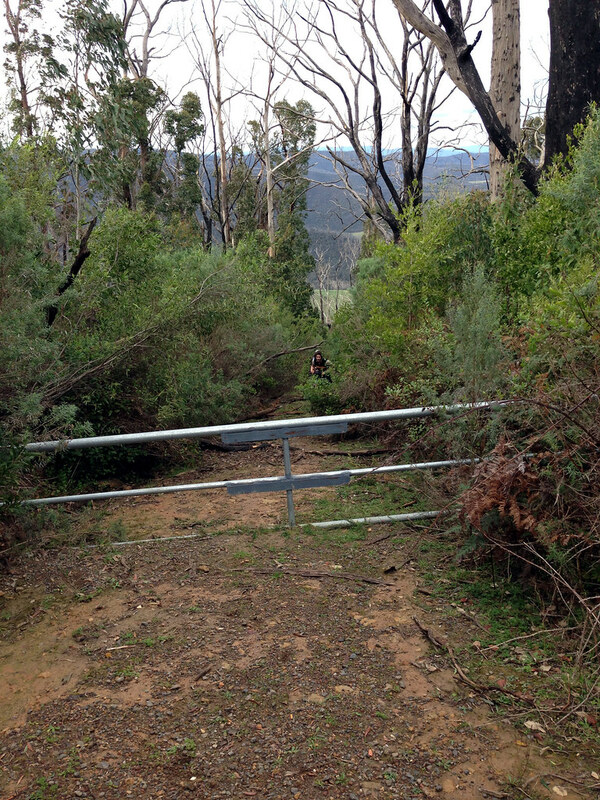 I floated a couple of alternatives before we decided on a shorter loop back up to Kinglake via Extons Road. I'd ridden this way before and loved it so I figured it would be a worthy reroute. It didn't disappoint. Oh, and we parted ways with Liam and John at this point too - they had prior commitments and had planned to turn back early in order to meet them. So, we rolled on into the wind for a while before getting onto Extons Road and following it all the way back to civilisation. It rolls nicely - mellow climbs followed by nice fast descents. There's enough features on the road to keep you on your toes, holes to pop over, puddles to skirt, ruts to carve aroud and, my favourite, 20-30 metre sections of railroad ballast that's been dumped on the road to fix up rutted-out muddy sections. They were usually at the bottom of a descent and had two slightly flattened-out lines through them, corresponding to 4wd tire tracks. First you pick your side - left or right - then hit it fast and try to float over the sharp-edged rocks without dinging your rims or losing too much speed. Fun. 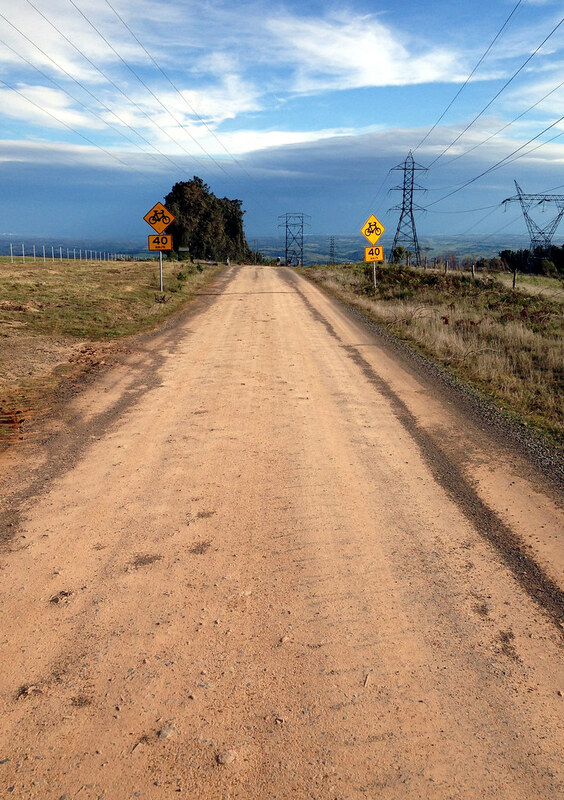 Soon enough, the gravel gave way to paved road again and we hit the main Kinglake Road for a couple hundred metres before heading down everyone's favourite scary-fast descent, Bowden Spur Road. Steep, rocky, loose and as fast as you want it to be. I snapped a few photos down the hill of riders negotiating the switchbacks. The view across Melbourne was as spectacular as ever - it's hard to take a boring photo from up there. And still no rain! A couple of us regrouped half way down and waited for Che who'd flatted again. Mark had just ridden down the DH course on his CX bike (!) and declared it to be too mellow and dumbed-down (though I don’t think he did any pancakes over the jumps). Nice work! So, it was a good if somewhat abbreviated day out, even though we didn't make it to the pub. Saw some nice out-of-the-way places, avoided the bad weather, ticked off a couple of roads from my list, met some rad dudes. What's not to love? Been waiting for you to post so that I could fill you in on what I did since I, as you kindly put it 'settled into a slower pace' - ie I got dropped at the first sniff of an incline, which did not augur well for the rest of the day. Did not want to be a lead weight at the back of the group. I was determined to 'do' the ride however and had the route in my Garmin, so my intention was just to trail you and finish sometime later, although I had already figured that that would mean I would run out of daylight.... I got a puncture shortly thereafter (glad I brought my own pump, at one point for weight-saving purposes, I had contemplated leaving it .... on the 'group ride, others will have one ' principle. ) After that I somehow lost the route, then recovered it in the wrong direction because I was heading back to Hursty, which after only an hour could not be right!! Well yeah, it WAS necessary, even without the 50 kmh headwind, very necessary. Every time I found a - relatively - flat spot and started to ride my quads did not want to know! Anyway I got there, enjoying the spectacular city views, the low wattles and other native flora on the way. Didn't enjoy eating the dust of the stereotypical vn-commy-driving-rally-dickhead, but who would? I would have left you guys some sort of cryptic sign, to confuse and amuse on your later descent, if only I had known. Despite having a bagful of carbs, most of which ultimately survived the ride intact, I stopped in Kinglake for a pastie, a coffee and a beer. I found the Kinglake Pub depressing, and there was no sport whatsoever taking place in their 'sportsbar' - just a collection of sad bogans gambling on the horses, be they real or virtual, it didn't seem to matter. 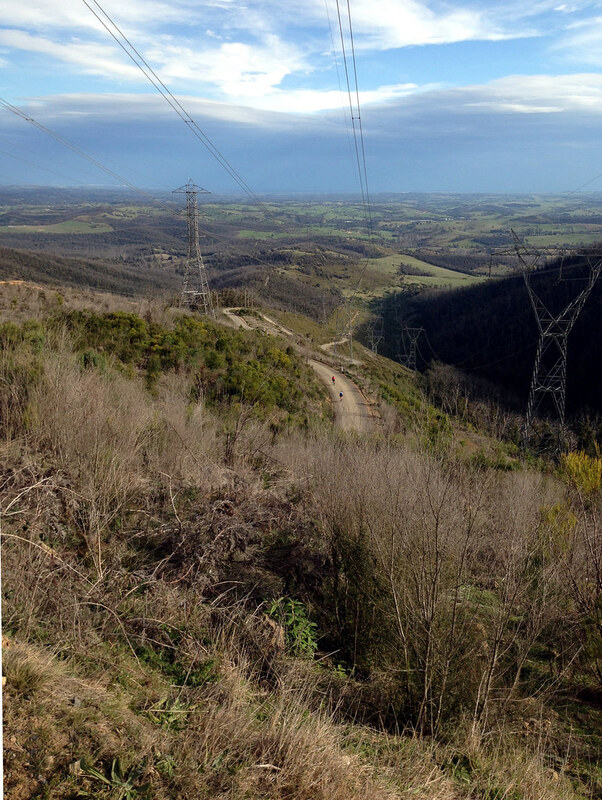 I have ridden from Hursty up to Kinglake twice but never gone down the hill, so that was a new and enjoyable experience, particuarly as I was free of the crosswind that had tried to blow me in front of traffic on the short roadride into Kinglake. I made reasonable time down the hill and thence to Hurstbridge, enjoying the warm sun and the greenery as I did so. I had clocked aroung 80km at that point and felt I needed to punish myself a bit more and at least get to 100 so I could hold my head up next time I ran into Al and Toby. I hooked up with 2 guys on mtbs at the station, there advice was to take the train (conveniently arriving NOW) to Eltham and ride back to the city on the main Yarra trail. Which is what I did, until I lost the trail somehow (!) and ended up roading it the last 10k or so. Got back to Richmond at dusk, much the same time as I gather you guys hit town, and just in time to escape the rain and enjoy a reviving seafood noodle soup on Vic st.
Nice one Neil! Thanks for the update and glad you pushed on to make a solid day of it and see some new roads. Anyone who gets up Bowden Spur by bicycle is a legend in my book and yeah, it's bloody hard enough to keep moving at the best of times, would have been a killer with that headwind!